If you’re anything like me, you buy most of your clothes online. It’s easy, convenient, and a great way to comparison shop. The problem, of course, is that you can’t try things on, so you don’t know how things will fit before they arrive. Most of us just hit checkout and pray for the best. With shoes, things can be especially dicey. They need to fit right, but it’s not always so obvious whether they do when you try them on. You can walk around a bit to see if they’re comfortable, but comfort is subjective (especially when you really, really like the style and they were on sale). Plus, shoes often need a breaking in period to feel just-right anyway. Which is why it’s not that surprising when you hear about guys spending a pretty penny on a nice shoe collection, only to find out a year or two later that they bought everything in the wrong size. So, to avoid that, here’s a quick and dirty guide on how shoes should fit. From the basics to the less-known pointers. As Jesse noted, if you’ve never been professionally measured with a Brannock device, the chances that you know your real size are slim. Most guys assume they’re whatever size they picked for sneakers in high school, but sneakers are sized differently than dress shoes, and most are very cushy. Which means, if you’re a half size off, it might not be a big deal. 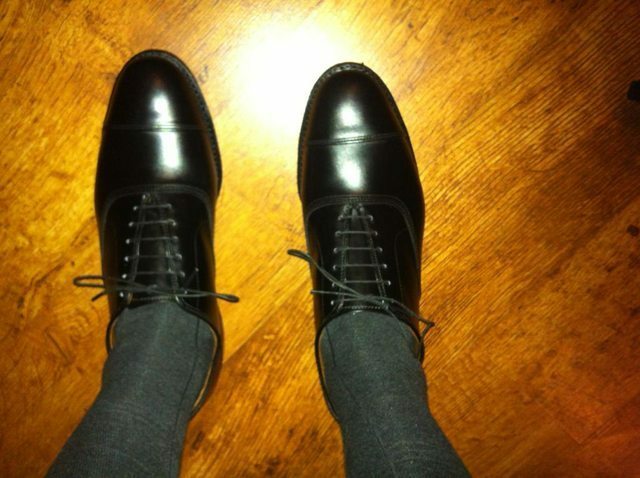 Dress shoes, on the other hand, are a lot less forgiving, so you need to know your true size. To find it, go somewhere like Nordstrom to get measured. Once you know your true size, you can use that as a baseline for getting sizing advice. If you’re buying from a store, ask a sales rep; if you’re shopping on eBay, turn to StyleForum (where there’s a wealth of advice in the archives). Remember: different shoes fit differently, so sometimes you’ll have to size up or down (although, most dress shoes do fit true-to-size). As you know, shoes are sized by length and width. Let’s start with length. Except for certain slip-ons, there should always be a bit of space between the ends of your shoes and your toes, which means if your toes are butting up against the shoe, you need to size up in length. Similarly, make sure the ball of your feet match up with the ball of the shoe. Width, as we’ve mentioned, is more about the total circumference of the shoe, as measured around the ball, rather than just the width itself. So if your shoes feel tight at the sides or top, then size up in width. Remember: leather breaks in pretty easily, so don’t worry if they’re a touch snug. They just shouldn’t feel painful when you walk. Perhaps the best way to tell if your shoes fit is by seeing how the eyelets look when you lace them up. If the eyelets are really far apart, like you see above, then you’ll need to size up (most likely in width). If they come crashing together, then you’ll need to size down. Additionally, check to see where your shoes bend as you walk. Proper fitting shoes should flex pretty close to where your foot naturally flexes. If you see the creasing creep up too close to the toes, you’ll want to size down (this is easiest to tell on cap toe shoes, where the creases should never cross into the cap itself). If the leather is cutting into your foot as it bends, then you’ll want to size up. Finally, a word about heel slippage. Don’t think that just because your heel slips a little that your shoes are too big (obviously, the term “a little” can be subjective, so use your best judgment). Some shoes have really stiff soles, and they’ll need a little breaking in before they feel right (this is mostly true for slip-ons, such as double monks and loafers). If they slip just a tiny bit, but everything else above checks in nicely, then trust that you probably have the right size.